If you can’t make it out to the Worcester Art Museum to stand among hundreds of cat-themed works of art and visit the institution’s interactive cat display, a place to pet a host of furry felines, don’t fret — there’s a webcam for that. The “Meow Cam,” which can be accessed 24-7, is part of the “Cats-in-Residence Program,” a collaborative — wait for it — “purr-formance piece” by artist-curator Rhonda Lieberman. The traveling installation was brought to the Worcester museum this week for “Meow: a Cat-Inspired Exhibition,” a multi-faceted project that takes a look at the role the household pets have played throughout history in both art and pop culture, right up through the Internet age. If watching from afar won’t quell your cat-cravings, visitors to the museum can step inside the cat-filled enclosure and interact with the pets. There’s a 30-minute visiting period for each person. 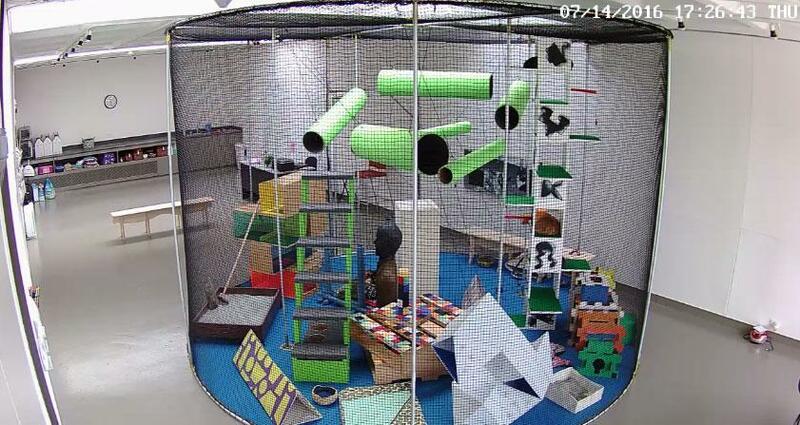 The exhibit, a mesh enclosure filled with artistic platforms for the cats to climb on and through, is presented in partnership with the Worcester Animal Rescue League, according to the museum. All the cats on display are available for adoption. The Worcester appearance marks the fourth Cats-in-Residence show ever. Fifty-five cats have found homes through the project in other cities. Both “Meow: A Cat-Inspired Exhibition,” and Cats-in-Residence run through Sept. 4.